When the “Big Four,” Metallica, Slayer, Megadeth and Anthrax, shared a stage together on June 22nd, 2010, in Sofia, Bulgaria, it was the moment their fans had waited decades for. That monumental show was beamed live into over 1000 theatres worldwide via satellite in a special HD cinematic event. On November 2nd, 2010, this legendary concert will be available on DVD through Warner Bros. Records. “The Big Four Live From Sofia” includes full shows from all four bands on a two-disc set as well as behind the scenes and interview footage. In addition to the two DVD set and the corresponding Blu-Ray, there will be a limited edition “Super Deluxe” Box Set including the 2 DVD set, five CD’s with ALL 5 HOURS of music, a 24 page booklet, a two-sided poster, photos of each band, and a collectable Big 4 guitar pick. In December 2009, the bands announced that they would be joining forces to take part in the traveling Sonisphere Festival for only 7 shows across Europe. This one-time only event, from the Sofia show, made it possible for fans far and wide to participate in what otherwise was a very limited run of dates. Every one of the Slayer live-in-concert DVDs represents a different era of the band: “Live Intrusion” was recorded on March 12, 1995 at the Mesa Amphitheatre in Mesa, AZ, and features guitarists Kerry King and Jeff Hanneman, bassist/vocalist Tom Araya, and drummer Paul Bostaph. The disc, which is certified Gold, includes some of the most classic Slayer songs such as “Raining Blood” and “War Ensemble,” but also some early special tracks like “At Dawn They Sleep” and “Captor of Sin.” As a bonus, Machine Head’s Robb Flynn and Chris Kontos join the band on-stage for a cover of Venom’s “Witching Hour.” The opening of “Live Intrusion” features a look at some of the band’s very unique fans, in particular, with special emphasis placed upon the fan from the mid-90s who had “Slayer” carved onto his forearm. In addition, the quality of “Live Intrusion” is high-end, as the original VHS master was located and used to create the DVD. “War at the Warfield” was filmed at the Warfield Theatre in San Francisco, CA on December 7, 2001, and like “Live Intrusion,” features drummer Paul Bostaph, marking his last release with Slayer before original drummer, Dave Lombardo, rejoined the band. “Seasons in the Abyss,” “Mandatory Suicide,” and “Disciple” are some of the jewels on this live collection that debuted at #3 on Billboard’s DVD chart, and has since been certified Gold. 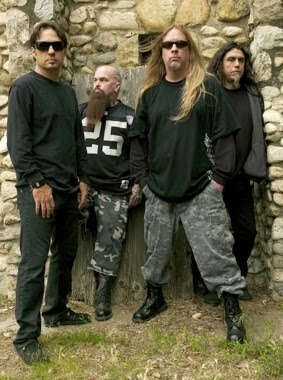 The Chicago Tribune’s long-time pop music critic Greg Kot wrote that Slayer “is one of the great American rock bands of the last 30 years, forget about genre.” Over the past near three-decades, Slayer has created some of thrash/metal’s most enduring and influential recordings – 1986’s “Reign In Blood,” 1990’s “Seasons in the Abyss,” up to the band’s latest, 2009’s “World Painted Blood.” Long-time fans will attest that nothing comes close to experiencing a Slayer show live and in the flesh; but there’s no denying how the band’s intensity and heaviness translates to these three killer DVDs.